Director Peter Berg on the set of his latest film Battleship. One of the movie podcasts that I listen to is KCRW’s The Business. It’s predominantly an interview show where host Kim Masters of The Hollywood Reporter interviews actors, directors, producers, and creators “about the business of show business. 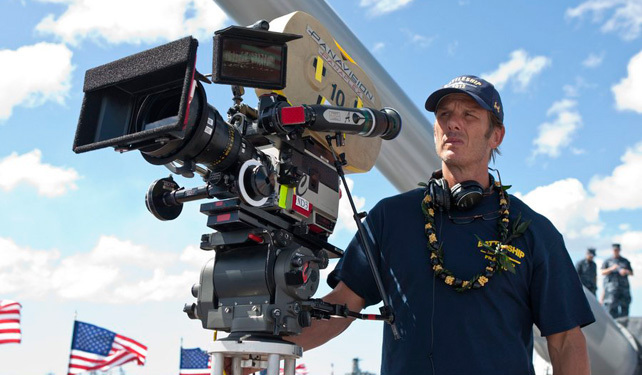 It goes beyond the glitz and glamour to the who, what, why and how of making movies and TV.” In honor of RIMPAC 2012 starting last week, I wanted to look at a recent episode of The Business where director Peter Berg was on the show and talked about some of the fallout on his latest film Battleship. Battleship as you may recall, did not do well here in the United States and currently has only brought in about $63 million. However, Battleship’s silver lining is that it made $239 million overseas for a combined total of about $300 million. Not bad, though not great when you consider the budget for Battleship was $209 million. Number crunching aside, what I found really interesting about Berg’s interview is how calculating and “assembly-line” like making Hollywood blockbusters are. Schedules are locked in, release dates are locked in, and everything along the way needs to contribute in some way to making sure the film comes out on time. If not, money could be lost on a film as millions of dollars are at stake. “We sunk your Battleship.” No, not The Avengers . . . aliens. Battleship did under perform domestically, but none of us saw the nuclear bomb that Avengers was going to be . . . if you look at the history of the Marvel films, if you look at Iron Man you look at Thor, if you go talk to the people that predict it the people in Hollywood who, all they do is study tracking, read the tea leaves; everyone thought, everyone in the business thought that Avengers would open to $80 million, maybe $85, would drop off 65% second weekend, another 60% the third weekend so that we felt by the time that the third weekend came . . . [Avengers didn’t follow that and just went] up and up and up. And then it opens to the largest weekend in film, north of $200 million, and its third weekend when we come out it makes $62 million dollars. While being beaten down by The Avengers is exactly what happened, there are definitely other reasons why Battleship didn’t do too well–first and foremost being, the movie was about frigging aliens. Getting people to buy in to an adaptation of a board game such as Battleship was definitely a big enough challenge to begin with, but when it was announced that the antagonists of the film were aliens . . . that in my opinion, turned the movie from something curious, into something preposterous (and not in a good way). As much as I liked the film (3.5/5 stars, Red Band Redux), it definitely was no Avengers killer–something that a better movie would have been able to do. Peter Berg with lead actor Taylor Kitsch. The poor box office we incurred domestically from my mind was primarily the result of a bad release schedule. If you look, we made quite a bit of money internationally, it would have made a lot more, it underperformed by about $40 million in China because nobody realized James Cameron was bringing Titanic 3D a week before us. That was a monster hit. When I was in China doing press for Battleship Chinese journalists were crazy looking at me like “Titanic 3D?” Titanic 3D . . . that’s an issue? “Oh yes.” [The Chinese] never got to see it the first time, they’re crazy about 3D films; so if we had come out and there were a lot of reasons why we couldn’t pull it ahead domestically; but if we had come out 3 weeks ahead of Avengers [in the US like we did internationally] it would have been a different story. It gets really complicated. We had so many [commercial] tie-ins with companies like Subway, Coke, Cisco; they had all committed a ton of money, they had a media strategy that was tied in to a release date that was three weeks after Avengers; and it just became a real pain in the but to move it. As always, marketing seems to always play a big role in movies . . . sometimes to the detriment of a film. But would a different release date (something before Avengers in April or a few weeks later in June) have helped? Maybe, but it’s really hard to say. For whatever reason, Americans do tend to frequent the cineplex more in summer than other time of the year so unless you have a surefire hit (à la The Hunger Games), releasing before summer is a calculated risk. On the other side of that if you release later in summer, you still have to contend with the other summer movies. What’s wrong with Hollywood blockbusters in development right now? Both Taylor Kitsch and Rihanna try to get to the bottom of that. I think there’s a lot of pressure on studios to take these big swings and have these big contacts and have home runs. And it’s not easy to make these films. And it’s not easy when you’re locked in to a release date and you’ve got a film that is going to be seen–all of [these big budget films] have huge visual effects components. And the reality is when you make these films the visual effects aren’t coming in till the very–sometimes, you’d be shocked at how last minute, maybe a week before a release you’re still sliding shots in, completed shots in. You don’t have the luxury of really knowing what you have often times till it’s too late. He then goes on to talk about how with smaller films, dramas with just a few actors, a reshoot could cost just a couple of days for maybe $40,000 whereas a visual effect shot for something like Battleship could cost a couple of millions of dollars and take weeks to months to redo. All scary thoughts when there’s a movie you want to see that’s not finished till the week before it comes out. And even then, just the decision to go with footage that you have–even though it may not be great footage or what’s best for your film; that’s gotta be tough for any filmmaker to swallow. For these big Hollywood movies though, that’s life. You have to make the release date or loose millions of dollars. If you do have some time, I really encourage you to listen to the podcast to hear Berg talk about more in detail about the film. A lot of it might sound like he’s defending his film, but there are some good nuggets in there that are interesting to hear. You can find out more about KCRW’s The Business here and download this specific podcast episode here. Darth Vader wasn't too keen on this year's crop of Super Bowl trailers. And he wasn't the only one. The Super Bowl. Probably the single biggest sports day in America every year. With approximately 111 million people tuning in to this year’s game, it’s understandable why commercial spots reportedly were coming in at $3.5 million for 30 seconds–with a captive audience you know your commercial is going to be seen by a lot of people. With that in mind, I didn’t think this year’s crop of trailers provided any Earth-shattering splashes. Almost all the trailers shown this year employed a good mix of combining new and old footage. What I didn’t like this year was the whole “teasing” or “previewing” and even releasing of trailers and commercials days before they were to air. To me, you spend all this money to play it before a captive audience and I just feel it dilutes the commercial by releasing it online before the game. Isn’t the point to try and make people stay to watch your commercial and not give them a reason to not watch it during the game? I don’t know, maybe that’s just me. In any case, there were some things that got me excited for the upcoming crop of films that we’re going to get later this year. A thing to remember about these “mini-reviews” is that they mainly talk about the level of excitement that I felt for the film after watching the trailers AND NOT on the potential quality of the films. As we’re only about six weeks out from release, it only made sense that Lionsgate released a trailer from the film. While there was old footage shown, I thought we got a lot great new footage as well. Of the new stuff that we saw, I think I enjoyed seeing the interaction between Stanley Tucci’s TV host character and the District 12 tributes in the scenes where they’re being interviewed. The sacrifice of the Reaping and the hardship of the games themselves were definitely conveyed well in the trailer as well. On a side note, fans will be happy to know that this trailer wasn’t just limited to being seen during the Super Bowl. The minute long trailer is also a theatrical trailer and will be playing in front of select movies at a theater near you. I thought there were some really great one-liners that this trailer brought out that definitely are playing up the comedic vibe of the film. I don’t really recall ever watching the TV series, but I don’t think it was a comedic television series. Jonah Hill we all know can bring the funny and hopefully by playing off straight-man Channing Tatum will make the new 21 Jump Street a fun action comedy. Wasn’t too excited by this trailer. Probably the best thing going for it is that there seems to be some really well done CGI action sequences which come through from the trailer. Other than that, there’s not too much to write home about. Probably what I liked best about this trailer was that they mixed great footage with Eminem’s Not Afraid–which by itself was pretty good to begin with. However, what really made it better was that they sync’d it to the chorus; which I thought really fit with the theme of the film and the scenes they showed in the trailer. Inspirational, harrowing, a sense of brotherhood . . . all the things Navy SEALS represent or convey. I think it’s safe to say that anytime you have Denzel Washington going guns-blazing, in hot hot heat, and getting into Ryan Reynold’s head (which all appear in this trailer) . . . you’re going to end up with a fun time at the movies. The trailer plays up the movie’s strengths: the chemistry between the two leads and showcasing the action. Formulaic to be sure, but it’s got everything you need for a solid star driven action film. I actually think it was a good movie to cut this trailer for the Super Bowl. With the exception of the introduction about knowing the final score of the game, all the footage is from the current theatrical trailer. When it played, everyone at my viewing party seemed to get pretty good laughs out of it–a good indicator that the current trailer hasn’t had too much exposure. Personally, I’m not a Sacha Baron Cohen fan, but like I said, good exposure for the film. I don’t know if it was a good thing or a bad thing that for maybe the first 10-15 seconds of this trailer, people thought that it was another installment of the Transformers franchise. I will say that I liked seeing a lot of new footage of the aliens and a lot more action sequences. What definitely troubles me is that we actually saw the aliens themselves and I don’t ever recall the last time we’ve ever had “cool looking” aliens. After seeing the new footage in this trailer I’m a little bit more excited for the film, and hopeful as well because it was partly shot in Hawaii. I just don’t know what it is about this film, but I can’t really get excited for anything about it. I thought the clip-collaging in the shape of the film’s title was the most uninspiring thing in the world. It was as if the title of the film is more important than showing us what it’s about. Granted the extended version (linked above) shows more full screen footage that shows off the film, but what we saw during the game didn’t have that. Not good when you only have a few seconds to make a great (or not so great) impression. I have no idea what The Lorax is about, but I do know it’s vibrantly animated and appears to have a few good laughs. What I like is that even though the film is from a different production company and studio than the previous Seuss movie (Horton Hears a Who), it pretty much looks to have the exact same style–definitely a good thing as those that liked Horton will probably come back for more. It should also bring in people who like great animation as well. What I didn’t like about this trailer was the fact that they mixed in footage from the Original Trilogy (OT). I can sort of understand why they did it (it’s because Episode I kicks off the entire trilogy in 3D), but it really felt like they were trying to bamboozle people by saying that the OT films will be in 3D. This was by far my favorite trailer from this year’s Super Bowl and I was actually kind of surprised because I hadn’t heard any pre-game buzz about a new trailer coming out. What I liked was that we saw the superheroes working together more in the clips in this trailer. The best part definitely had to be towards the end where there was the camera shot spinning around the team–talk about money shot. Then to top it all off, in the extended version (embedded above) the final sequence is of the Hulk jumping in the air and taking down some flyers. Can’t wait for May! You have to admit, the visuals alone definitely make this movie look exciting. The film is based off a cartoon so some of the more “out there” moments have to be expected . . . I just hope that they learned their lesson from the first installment and allocated more of the budget to the CG effects AND a better story. The Rock seems to be a solid choice to be in the film, especially since he looks almost like his character from Fast Five. Though I think the addition of Willis maybe a bit over the top. This year’s Super Bowl also featured a number of movie related commercials that weren’t movie trailers. I thought it was a cool and smart move by these companies to go this route as it definitely offered a different hook for their spots and overall I felt left a good impression with viewers. Something else that stood out was that a lot of the spots were also directed by feature film directors as well. It was probably one of the most anticipated commercials going into the weekend . . . before Honda released the trailer online. They did a really great job of teasing the spot by releasing a short 10 second teaser the Thursday going into the weekend. However, by the next day the full spot was online, which I definitely think deflated its appearance during the game. Nevertheless, I liked the spot and how it riffed off of Ferris Bueller’s Day Off, though I didn’t really notice the car in the commcercial. An extended 2+ minute version was also cut and released. In the extended version, there are more Day Off references and more shots of the CR-V. The movie reference in this commercial doesn’t happen till the end, but I thought it was really fun that VW referenced their Super Bowl spot last year by putting Darth Vader in the Mos Eisley Cantina as a post-credit stinger of sorts. Short, sweet, smart, and funny. Aside from The Avengers, I’d have to say that this was the commercial that I liked the most. The only movie reference that you’ll find in this commercial is that actor turned director Clint Eastwood narrates and appears in the spot. It’s edited together very movie trailer-like with Eastwood’s narration providing inspirational and uplifting words. Though I thought the metaphor was a little off, I still thought it was really well done and built on their “Imported From Detroit” message that they started last year with the Eminem Super Bowl spot. With another Super Bowl in the books, luckily us moviegoers won’t have to wait till the fall to see if the excitement from these trailers is warranted. Was there a particular trailer from the big game that you liked or another movie related commercial that I missed? Hit us up in the comments to let us know and share your thoughts!